May 11th, Christies Private Sale presented in Geneva a unique piece resulting of a creative collaboration between Roland Iten and Claude Sfeir. 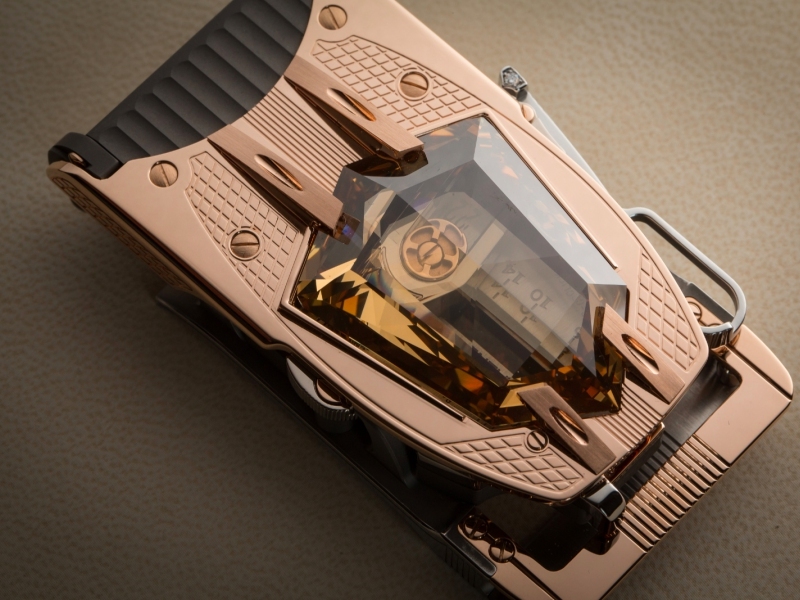 The R60 Carat “Diablo” is a mechanical belt buckle set with a unique 60.66 carats cognac diamond. Roland Iten is the pioneer of mechanical luxury for gentlemen and Claude Sfeir is the world renowned jewelry expert and watch collector. The shared vision of the two bespoke artists with perfection and class blended into one single piece of jewelry that came to life in the most spectacular way. The R60 Diablo is minimalistic and clean in order to introduce a more spectacular and dashing stone into a man’s everyday attire. 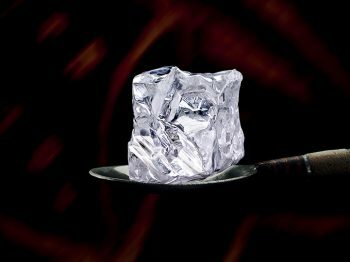 Diamonds such as the spectacular 60.66 carat “Diablo” are usually reserved for female jewelry. Yet Roland Iten presented an interesting masculine perspective of the use of such a stone. 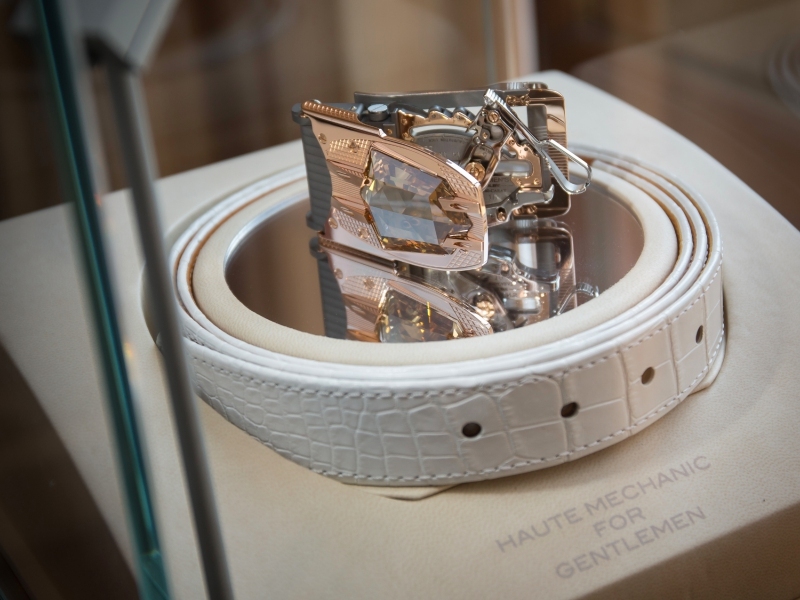 The creation of the mechanical belt buckle set with the cognac diamond is a revolutionary milestone changing the view on how male accessories are perceived. 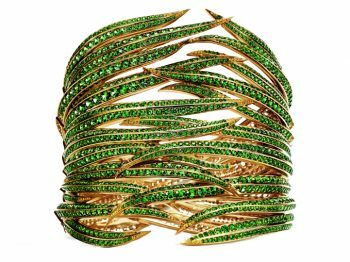 Claude Sfeir is one of the most respected collectors of his generation -a self-taught aficionado with a passion for fine jewelry since his trip to Beirut during the late 1970’s. He quickly gained a reputation for “having an eye” for quality gems and clients started lining soon after. With over 35 years of experience in the field of jewelry and watchmaking, Claude has earned the respect of his peers as a knowledgeable expert. He presides on the Jury of the the Grand Prix d’Horlogerie de Geneve, the watch industry’s most important annual event – dubbed as he “Oscars” of horology. Roland Iten is a well-respected pioneer in micro-mechanics and owner of numerous patents for calibration of belt buckle mechanisms. He has been commissioned by master watchmakers for his impeccable work that is a spectacular blend of precision, attention to detail and meticulous craftsmanship. A portion of the sales of the R60 will be donated to a cause personally chosen by Roland Iten – The Art Center College of Design Norman Shureman Memorial Scholarship Trust. A professor who was Roland’s mentor and personal friend of his was killed tragically 5 years ago. The trust set up in his name provides product design education to talented individuals who are not able to afford private tuition. 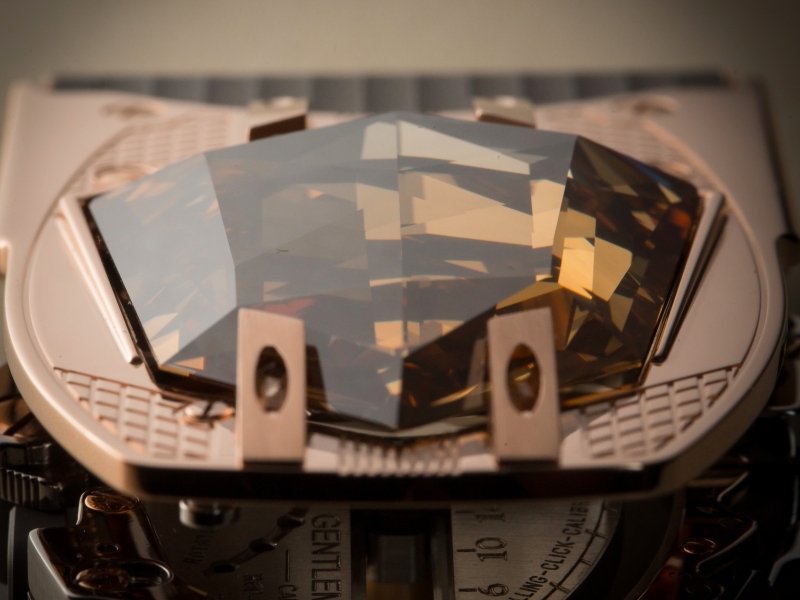 The uniqueness of the 60.66 carat spectacular orange-brown kite-shaped diamond can be traced back almost 160 years, but the diamond itself is believed to be much older. Orange is one of the rarest nuances found naturally in diamonds and is among the most sought-after by collectors. This diamond is classified as an extremely rare, type IIa diamond – less than 2% of all diamonds earn this classification and are the purest of diamonds with exceptional optical transparency. Discovered in India, the stone comes from the Golconda region – famous for the world’s most famous diamonds like the 45.52 carat Hope Diamond. Due to its age and origin, “The 60.66 Diablo” is considered conflict-free. The 60.66 carat Diablo Diamond has been certified as Type IIa by the Gemological Institute of America (GIA) in a report from April 2010 and Christian Dunaigre Gemstone Report from November 2012. All corners of the stone are visible but protected by a separate surrounding gold embankment, allowing its full and unique kite- shaped cut to be visible from both sides of the buckle plate, contributing to the elegance and extravagance of the piece. Roland insisted that the setting of the stone enhanced its rare cut, so he created a unique suspension pillar system and a mechanical mount to allow the stone to appear floating above the buckle plate. An unlimited warranty against manufacture defect accompanies the R60 Carat Diablo Unique Piece to ensure its lifetime is at least as long as its crown jewel. Roland Iten is best known for creating male mechanical accessories, which are both functional and aesthetically- pleasing. Manufactured in Switzerland the R60 Carat Diablo is comprised of precisely 109 components in solid 5N red and 18K white gold with a heavy titanium frame. 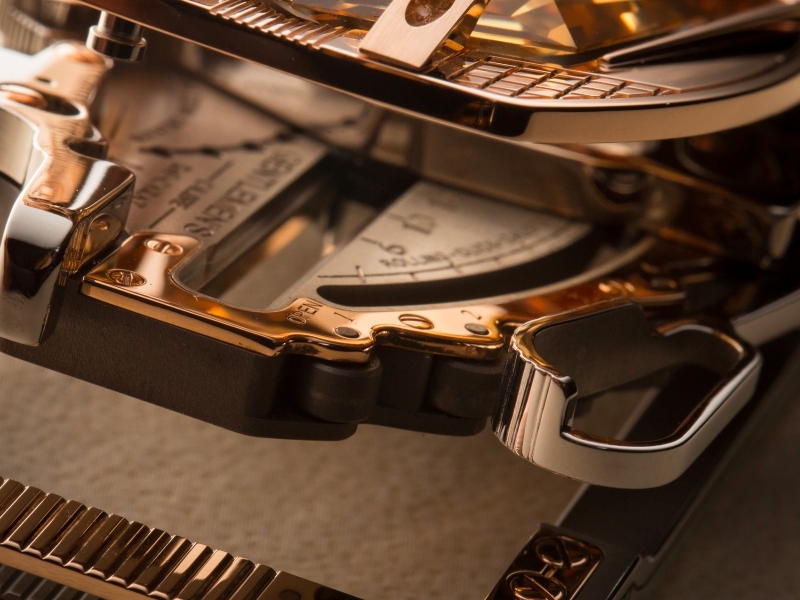 Each component has been designed and assembled to rival the finest watch movements. 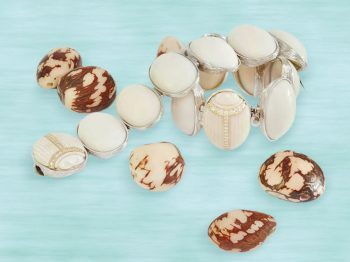 Its hand-crafted bridges, cogs, wheels, springs and pinions interconnect to create a mechanism that allows the wearer to obtain a comfortable and precise fit. The 17-axel construction allows for an exact adjustment and expansion range of 22mm.The piece is entirely handcrafted, polished and assembled by professionals in Geneva, with the production process supervised by Roland Iten himself. Roland was captivated by the clarity of the Diablo diamond and as with all his creations, he insisted on the functional role of the gem in the piece as opposed to a simply ornamental one. 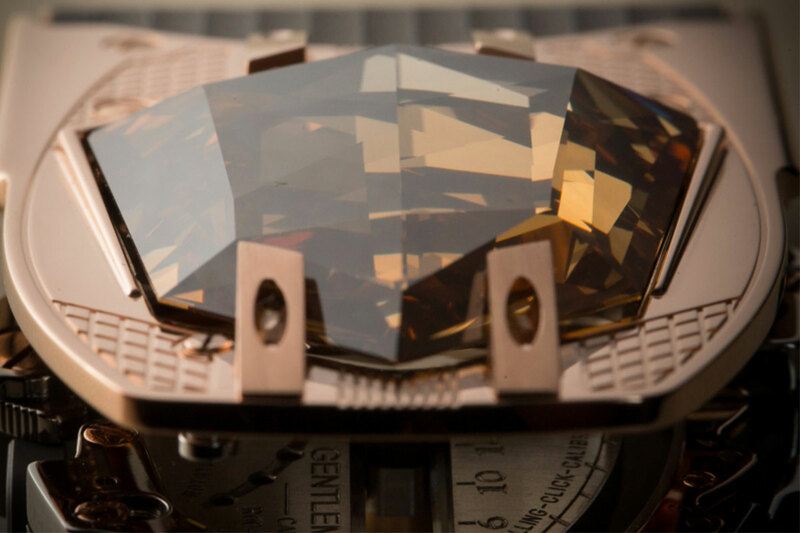 The case of the buckle was designed based on the rolling click calibration patent which Roland invented in 2008 and matches the robustness and longevity of the diamond itself. The key feature of this patent is a reverse engineered “engrenage” mechanism with flow-guiding wheels in place of toothed-cogs, which permits zero friction. This unique has been named the “click-free click”. Five “gears” in total allow fine-tuning calibration of 0-22mm and the accompanying vertical rotating friction controlled pin together with the mechanically leveraged belt insertion clip ensure the longevity of the mechanism and demonstrate the incredible mechanical savoir-faire of the complex piece. Undeniably, the heart of the piece is the mechanism in clear view beneath the case – achieved thanks to the crystal clarity of the Diablo Diamond. For security treasons two patented systems ensure that the buckle stays in place. The cover locks to the chassis with a manually operated mechanical click lock and the chassis locks itself to the leather strap through a manually operated spring locking system.